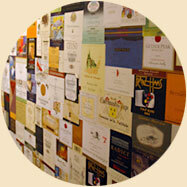 The term enoteca has several definitions— wine shop, wine bar, and wine library, among others. But at Bin 26 Enoteca, it also means a place to share in the pure enjoyment of wine, and the pleasure of pairing it with food — which is prepared very simply, to allow the honesty of the ingredients to come through. Foremost, we believe wine should be enjoyed, not feared. So, to that end we offer wines from around the world—each carefully chosen for its quality, value, and for the simple (but no less important) fact that it is delicious.